Metered parking in Harrisburg is FREE after 7 PM and all day Sunday. The best street parking is on Walnut Street and Commonwealth Ave. 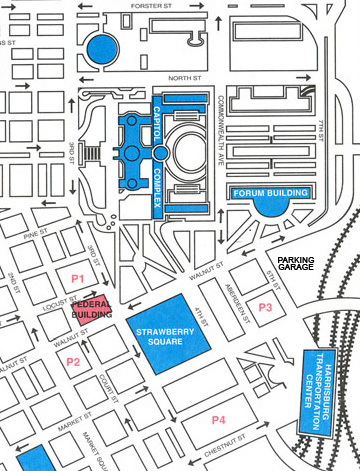 Parking for HSO Concerts is available in the Forum Place Garage on 5th Street between Market Street & Walnut Street. 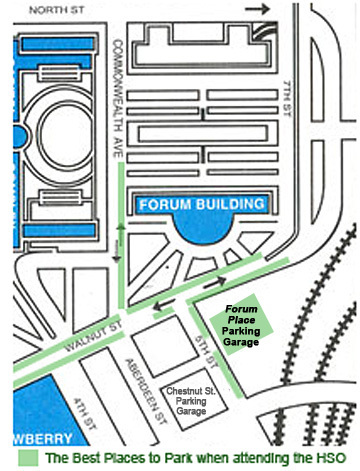 Forum Place parking is not available for weekday concerts. Event parking is $5 per vehicle. Take the Front Street/Fort Hunter Exit off Rt. 322 South of Dauphin. Continue on Front Street for approximately 5 miles until you reach Market Street. At the 4th light, turn left onto 5th Street. the Forum is directly in front of you (the building with the burgundy awning). Take Route 83 to the 2nd Street/Capitol Exit. At the 4th light turn right onto Market Street. At the 3rd light turn left onto 5th Street. Travel south on I-81 to the Progress Avenue exit. (Best Western & Fulton Bank on alternate corners). You are on Nationwide Drive. Turn left at the first street (Fed Ex box on corner), Corporate Circle. This road takes you right to the 800 Corporate Circle parking lot. Go into the tan stucco building. Our office is on the first floor, Suite 101. Travel north on I-81, to the Progress Avenue exit. At the end of the exit ramp, turn left at the light and pass under Rt. 81. At the light turn right onto Nationwide Drive (Best Western & Fulton Bank on alt corners). Turn left at the first street, Corporate Circle (at the Fed Ex box). If you are traveling north on I-83, follow to the I-83/I-81 split. Take the I-81 South exit (this is a left lane exit). Once on I-81 South, proceed to the far right lane to Progress Avenue exit. At the end of the exit ramp, proceed straight through the traffic light. You are on Nationwide Drive. Go into the tan stucco building. Our office is on the first floor, Suite 101. From the Lancaster or Philadelphia area, take the PA Turnpike (I-76) west to the Harrisburg East interchange. This places you on Rt. 283. Follow signs to I-83/I-81 North. Proceed to the I-83/I-81 split. Once on I-81 South, proceed to the far right lane – take the Progress Avenue exit. From the Pittsburgh area, take the PA Turnpike (I-76) east to the I-81/Carlisle interchange. Take I-81 North towards Harrisburg. Follow to the Progress Avenue exit.